Medley, FL – In today’s world, organizations all across the world are trying to discover ways to become more sustainable without affecting customer service, operations or overall organizational efficiency. The team at All Florida Paper is no different. The company has found innovative ways to not just become more eco-friendly, but at the same time, save time, money and hassle in the process for employees and customers while doing their part in providing a better environment for future generations. Below are some of their sustainability initiatives. All Florida Paper revamped their warehouse lighting system by installing high-output linear fluorescent lamps, commonly known as T5. Each lighting feature saves 2 tons of CO2 annually. In addition, they are using sensors, further reducing energy consumption. As a result, All Florida Paper is consuming less and less watts per year. While this change has translated to savings, their employees are also appreciative of a light that is softer on their eyes. All Florida Paper is increasing their resource utilization by delivering more while driving less. The company installed Roadnet Route Planning Software to help manage this initiative, and it is delivering remarkable results. The answer to increased delivery volumes is not always sending more trucks on the road, but rather, to make smart, efficient deliveries, which they have been able to spearhead with this new software. They are not only saving valuable resources, the company has also had a dramatic improvement in servicing their customers. 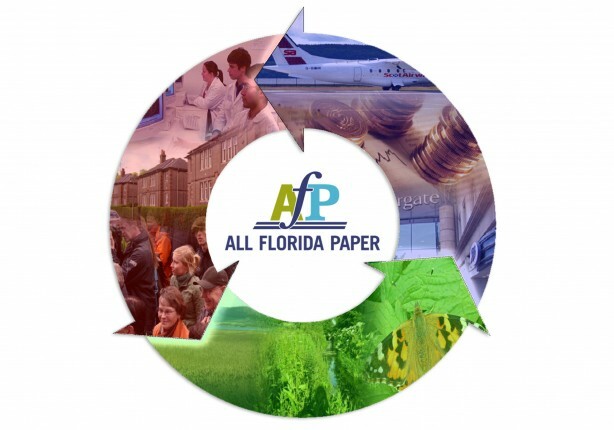 As an organization, All Florida Paper has significantly reduced waste. Most of this waste came from cardboard, broken timber pallets, and packaging film and paper. They developed and executed strategies that lifted their recycling rates through a number of recycling and packaging optimization initiatives, including working with suppliers to reduce packaging waste, reusing and recycling of cardboard in their warehouses, reusing pallets in innovative ways, and the diversion of all possible materials from the waste stream. For more information or to request an interview with All Florida Paper, please contact their media relations division at (786) 594-5240 or email them at ahannett@allfloridapaper.com.